As promised, following up from last weekend, here are the results of the Mother’s Day soul food feast. I think the pictures practically speak for themselves. The food was a triumph! 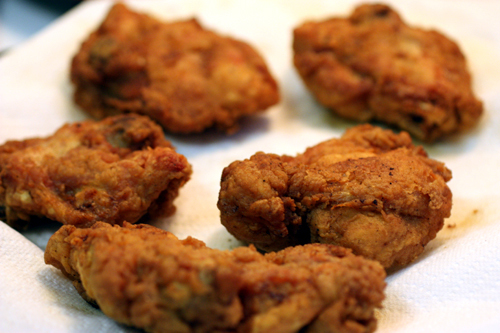 The only problem now is that since I know how very easy it is to make perfect fried chicken at home, I’ll want it all the time. I made a few adjustments to the recipes that were new to me (I can never resist). 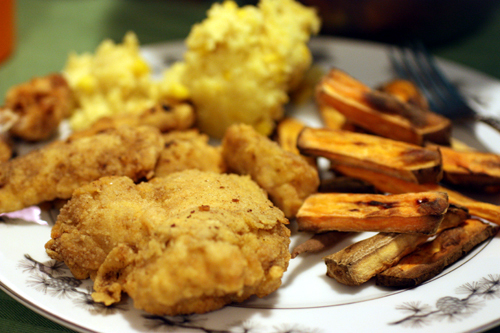 Keep reading for notes on how I made the perfectly fried chicken, sweet potato wedges and corn pudding. 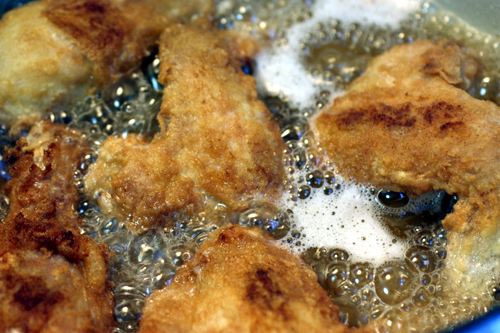 My concerns about the crust on the fried chicken not being crispy enough if left to steam in the oil were unfounded. I followed Paula Deen’s grandmother’s recipe, as mentioned last week, except that I fried the chicken in vegetable oil instead of shortening. I set up less than an inch of oil in an enameled cast-iron French oven because I wanted to make sure I had a good lid to cover the chicken after it crisped. The cast iron also helped regulate the heat and keep the oil as hot as it needed to be to get a good fry over the course of many batches. After the chicken had one flip, I covered the pan and lowered the heat just a little bit. For the dark meat, I left it covered for about 8 minutes, flipped the pieces and re-covered for another 5 minutes or so until I was sure the meat was done. The white meat cooked a bit quicker. Each piece was drained on paper towel and eaten right away. My mother, the chicken expert, said she had never had homemade fried chicken that didn’t come out either burnt, greasy, or too dry. This chicken was none of those things. The meat was moist and fell away from the bone (when there was a bone to fall away from). The crust was perfectly crunchy and golden, and not greasy at all. While the success should certainly be attributed to the great recipe I followed, I also think it had something to do with the chicken I used. 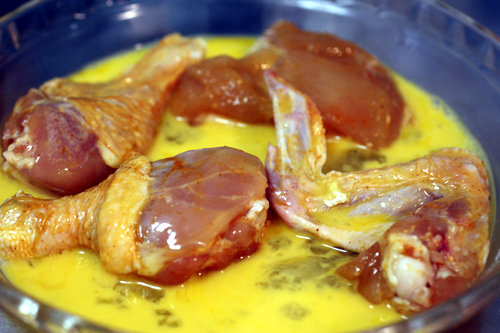 I bought two chickens on Saturday and butchered them myself that night. This was not only cheaper than buying pre-cut pieces of chicken; I got to trim all the parts to my own taste and not waste a thing. My best move, I think, was to take all of the white meat off the bone so that it could have as much surface area for crispiness as possible. All of the parts that didn’t make it into Sunday’s dinner went into my freezer stash for building chicken stock. And since the pieces were bought right before I needed them, I never had to freeze them, which surely increased their tenderness. I just gave them a little dry rub with some seasoned salt and pepper the night before and they were ready to be battered and fried according to the recipe right before dinner the next day. Since my favorite part of fried chicken is the crispies on the outside crust, the only thing I would change when making this chicken again is to add salt and pepper to the flour dredge. I didn’t have a recipe for the sweet potato wedges, and I was a bit worried about how to get them to come out crispy instead of mushy. After doing a bit of internet research, I gleaned tips from various blogs and threads and came up with a process that worked great for me. I cut the sweet potatoes into wedges, skins on. I soaked the wedges in cool water for 30-40 minutes. Then I let the wedges drain in a colander, preheated the oven to 400 degrees, and lined two cookie sheets with parchment paper. 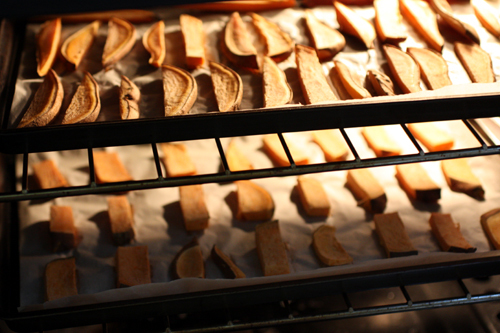 I lined up the wedges on the parchment paper with plenty of space between so the potatoes would roast and not steam. The wedges went in completely naked, without any seasoning or oil. Then, 15 minutes later, I gave them a flip and let them continue to cook until done. It took a couple of batches, but I was determined not to let them be mushy, so the extra time was worth it. The final product was tasty without adding any extra seasonings, but when I make them again I may decide to toss the wedges in a bit of sea salt the moment they come out of the oven, to encourage the flavors within each wedge to surface. 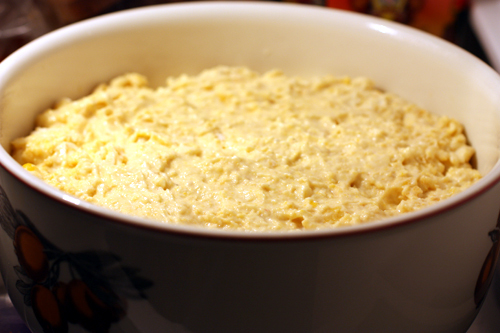 For the corn pudding, I mostly followed Paula’s corn casserole recipe. I didn’t have a box of corn bread mix on hand, so I just added the dry ingredients following a corn bread recipe I had on hand. If you do this, just substitute the box of mix with 1 1/2 cups corn meal, 1/2 cup flour, 1 tbsp baking powder, 1 tbsp sugar, and 1 tsp salt. I also left off the cheddar cheese, since my mom is not a fan. I might want to play with this recipe a bit more to get it a bit more pudding-like, but all in all, it was a delicious sweet and savory side. The chicken was crispy, and oh so tender, savory and meaty. The sweet potato wedges had a satisfying crunch to them, along with a hint of caramelization. The corn pudding had firm little kernels that popped in my mouth, surrounded by a full-bodied spoon-bread, and was sweet, fresh and mild. The different textures and flavors of these three dishes, along with the moist bitterness of the red swiss chard and chick peas, came together in great harmony. The whole family really enjoyed everything, and all the extra chicken I made was gobbled up, which is a great sign of a meal well done. All of this frying and experimenting with corn has got me craving something else wonderful, so expect to see me frying up some corn fritters here soon. I have a new recipe for them that I just can’t get enough of! Fluffy Corn Fritters, or are they Hushpuppies?